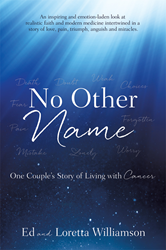 Ed and Loretta Williamson’s new book No Other NAME ($13.99, paperback, 9781545602010; $6.99, E-book, 9781545602027) is an inspiring and emotion-laden look at realistic faith and modern medicine intertwined in a story of love, pain, triumph, anguish, and miracles. Cancer crosses all religions and ethnicity forcing people on a journey of suffering. The readers are brought to the realization that life on earth is not about maximum physical health, but about maximizing a deep relationship with their Creator. Loretta and Ed were raised in a religious homes. They met working on the staff of Teen Challenge Ministries in New York City and served together 43 years in ministry in the local church and international ministry. Loretta and Ed earned post graduate degrees as well as being Chief Editor of the denominational Connection magazine. Ed has also written numerous articles. Xulon Press, a division of Salem Media Group, is the world’s largest Christian self-publisher, with more than 12,000 titles published to date. Retailers may order No Other NAME through Ingram Book Company and/or Spring Arbor Book Distributors. The book is available online through xulonpress.com/bookstore, amazon.com, and barnesandnoble.com.